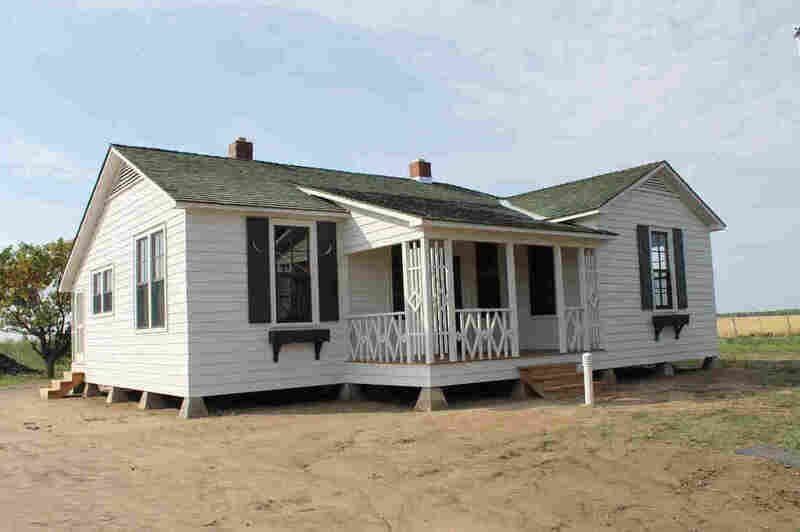 Johnny Cash's Boyhood Home Tells The Story Of A Town It's been almost 10 years since Cash died, but fans still travel from around the world to see the tiny, dilapidated house where he grew up. Now, it's undergoing a painstaking restoration, with plans to open it as a museum in 2013. Johnny Cash's brother Tommy Cash and sister Joanne Cash Yates have drawn on their own memories to assist in the authentic restoration of the house where they grew up. It's been almost a decade since Johnny Cash died, but fans still travel from around the world to see the place the music legend often described as key to his development: his boyhood home in the eastern Arkansas town of Dyess. The small house will soon serve as a museum — not only as a tribute to Johnny Cash, but also to tell the history of the town. 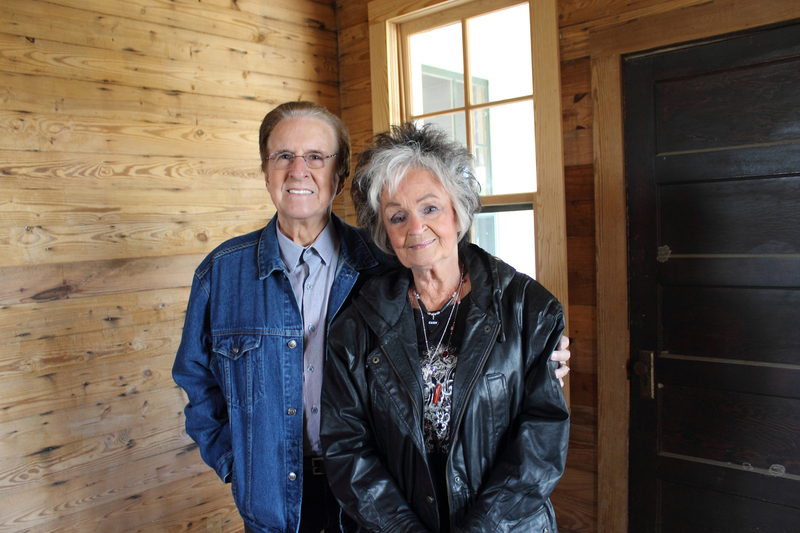 Cash's younger brother Tommy Cash and sister Joanne Cash Yates recently got to enter the small house for the first time since work to restore it got under way. Tommy says he hadn't seen it since Arkansas State University bought the house last year. "I'm just thrilled that they could take what was basic here and make it into a beautiful home like it was in 1935," he says. "I'm just overwhelmed. I can't imagine this is really happening. And all the rooms, they looked huge when we were kids. Mama was a great housekeeper, and she made it very homey for us." Johnny Cash was only 3 when his parents moved into the house on 20 acres of farmland. At a concert in 1969, he recounted, "You know, we come from the flat, black delta land in Arkansas; that's one of the places we come from. And after I got into the music field and started writing and recording and singing songs about the things I knew, I wrote a lot of songs about life as I knew it back when I was a little bitty boy." Dyess, Ark., was a planned community, created during the Great Depression as part of President Franklin Roosevelt's New Deal. Dr. Ruth Hawkins is the director of the Arkansas Heritage Sites program at Arkansas State University; she's overseeing efforts to restore the Cash home, along with the town's administration building and an old movie theater. "This was an agricultural resettlement colony," Hawkins says. "The Cash family was among the 500 colonists that were recruited to come here to get a new start in life." The Sims family moved to Dyess in the 1960s, and Larry Sims grew up just down the street from the Cash house. Now the mayor of Dyess, he wants visitors to get the town's full history.
" 'Course we know Johnny Cash is gonna bring them here, but we want to tell them about the people that struggled, and how the government gave them a hand to get them back on their feet and give them some pride," Sims says. "A lot of these people had never owned any land before — they always sharecropped and just scraped by working for the other guy. This was a new start. ... They could come in and start fresh with everything they needed." The Cash family sold the house in 1954. It passed from family to family for more than half a century, until the university bought it and began the restoration last February. The biggest problem was the foundation: It was built on sticky, heavy gumbo soil, which would constantly shift, causing the house to become unlevel. After lifting the entire structure up and building a new foundation, restorers peeled back layers of wall coverings and linoleum. Ruth Hawkins says they found the original wooden walls and tongue-and-groove flooring still intact. "I couldn't be more excited, because we want so badly for this to be an authentic restoration," Hawkins says. "We've depended a lot on Tommy and Joanne to describe things for us, and we want to get it right." The Cash family house today. Once the house reopens, Sims says he hopes it will attract even more visitors than those who already find their way to the town after visiting rock 'n' roll landmarks in Memphis, about 45 miles away. "We get them from Germany and England, France and Vietnam — it's just amazing," Sims says. "We just got through with a busload from Ireland. Of course, nothing's open yet, but it was their fourth year to come back, and they're keeping up with the progress as it goes along. They're just amazed every time they show up." One of those visitors was Matt Moler, who grew up in South Africa and today lives in Springfield, Mo. "My dad had an old Johnny Cash cassette tape, and I listened to that all over Africa," Moler says. "He's been a part of my life since I [was] a kid ... so it's just been a great opportunity being here." Joanne Cash Yates says that's just the reaction the Cash family is hoping for. "About a week before Johnny passed away, he said to me, 'Baby, when I'm gone, I wonder if anybody will really care,' " she says. "So I think he'd be real proud." The plans are to open the Cash house to the public as a museum by next September, in time to commemorate the 10th anniversary of Johnny Cash's death.